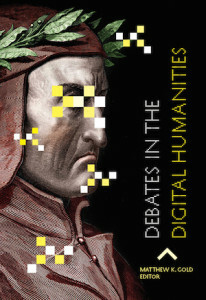 Jen Howard has a review in the Times Literary Supplement on Matthew Gold’s edited volume, Debates in the Digital Humanities. Gold is an assistant professor of English at New York City College of Technology, an advisor to the Provost for Master’s Programs and Digital Initiatives at the CUNY Graduate Center, and is the director of the CUNY Academic Commons. Earlier this year, I posted some of my reflections on the book in a post entitled, A Boundless Domain of Culture. 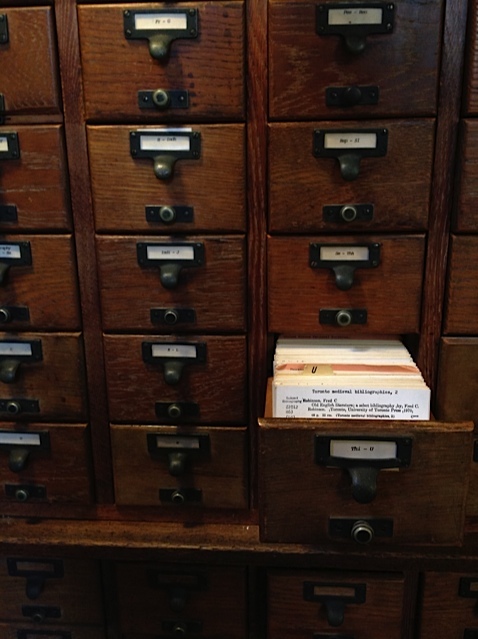 The arrival of the volume in the UK (and the upcoming launch of its online platform) comes on the heels of extensive coverage in North America and raises some important questions concerning the current monolingual nature of such debates (at least in print) and the dilemmas of digital humanists whose geographical and digital presence on the hub and spoke system of the map above continues to be dependent upon economic and political factors. It is, in fact, not such a boundless domain of culture after all. This Global Internet Map, by Telegeography, illustrates the Internet’s highest capacity routes and its global hub cities. We could easily compare this map to centerNet’s map of their international network of digital humanities centers and see a general convergence of the two. Yet, Telegeography’s assessment of future functionality of the Internet, a prerequisite for the growth and diffusion of the digital humanities as a scholarly practice, signals future challenges to scholarship not just for the digital humanities, but to all scholars working in the digital age. The essays in Gold’s volume touch on debates among those who inhabit cities proximate to that “Internet core.” Lisa Spiro, director of the US National Institute for Technology in Liberal Education Labs, indicates in her essay that the digital humanities converge around something called “Internet values.” These may include collaboration, the open sharing of information, and experimentation, but I would argue that they also should extend beyond what Howard Rheingold has dubbed netsmarts to questions of digital hegemony that are raised by the Internet’s physical infrastructure, explored recently in a book by Andrew Blum. Expanding these debates in the digital humanities to reimagine our notions about culture, knowledge, or communication could be, in the words of Andrew Prescott, the challenge of making the digital human. It’s day 1 of the ModLab Workshop at Yale with Dean Irvine, Matt Huculak, Kirsta Stapelfeldt, and Alan Stanley. We have great group of participants from across the disciplines – from anthropology to East Asian studies and from English to film studies. Several participants have DH projects under their belts, but many are just starting out. I handed over my files to Dean yesterday, newly digitized reproductions of glass lantern slides from the early 20th century. 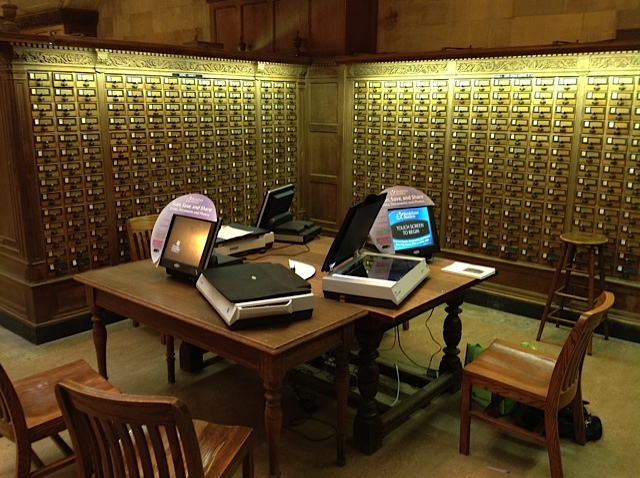 They gathered dust for decades in a black box forgotten in the corner of a campus office, their technology obsolete. I took this photowhile I was still trying to find someone to fund digitizing the box’s fragile contents. Fortunately, the Instructional Technology Group stepped in with the necessary funds and ITS Academic Technologies provided the expertise. The collection is a valuable visual archive in multiple respects. 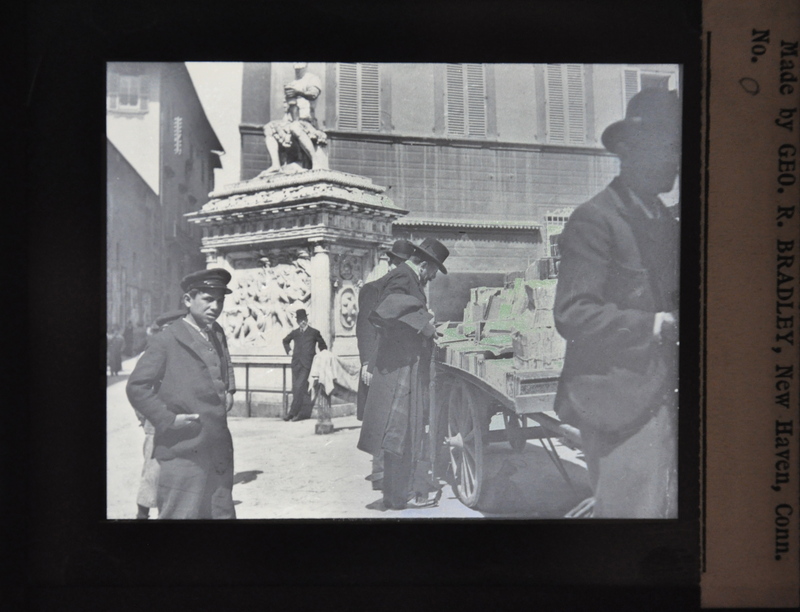 The photographs were taken during several grand tours of Italy between 1904 and 1912 and provide a unique perspective on the history of Anglophone tourism in Italy. They also provide precious historical documentation of cultural heritage sites in cities such as Florence, Venice, Assisi and Rome. Finally, the technology employed to reproduce these photographs indicates that their use was a public one: whether in the classroom for the undergraduates of Yale College or at public lectures, the lantern slide was the technology of choice for projecting images for a large audience. In 1903, at a meeting of the New Haven Medical Association at the medical school, Dr. Robert Osgoode, greatly impressed his audience with a splendidly illustrated lecture on “The Interpretation of X-ray findings in suspected diseases of the bone or soft parts” with an assortment of lantern slides. Their extensive use in education at the turn of the 19th century is also evinced by the large number of lantern slides found in a number of repositories at Yale. Beyond those found in the Harvey Cushing/ John Hay Whitney Medical Historical Library (including Dr. Osgoode’s), the Beinecke Rare Book and Manuscript Library houses William McClintock’s 1500 hand colored lantern slides of the Blackfoot Indians in the Yale Collection of Western Americana. The Yale Peabody Museum’s Division of Historical Scientific Instruments also has over 800 lantern slides, many of which contain material for physics lectures. While I still don’t know exactly in what context these slides were used, I could turn to the extensive William Inglis Morse lantern slide collection found in the Visual Resource Collection at the Robert B. Haas Family Library. While not as meticulously annotated as our mysterious black box, this collection also documents the Grand Tour in Italy and was probably used as an instructional technology tool for Yale College courses. The images collected by Morse, a philanthropist, historian, and clergyman are a particularly appropriate point of reference in this case given that Morse, like our instructors, came to Yale from Nova Scotia. In fact, Dalhousie University also houses Morse’s ‘scholar’s library‘ which, as he noted, “if properly selected and studied, is one’s best monument.” (from his Preface, Catalogue of the William Inglis Morse Collection at Dalhousie University Library (London: Curwen Press, 1938). Let’s hope Day 2 provides some valuable digital tools to better understanding and disseminating this unique visual archive which also serves as a valuable reminder of technological obsolescence. 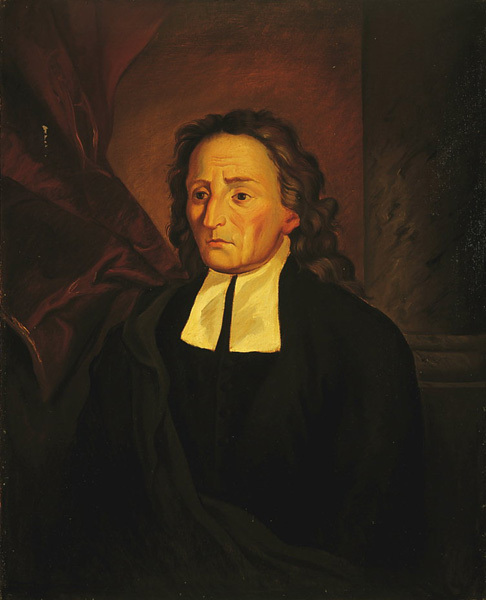 It might seem anachronistic to call on the work of an eighteenth century philosopher to elucidate some of the issues at play in the debates swirling around the digital humanities, but Giambattista Vico has been on my mind lately as we prepare for a conference on his work today and tomorrow at the Beinecke Rare Book and Manuscript Library. Vico (1668-1744) was an Italian philosopher, rhetorician and jurist. He worked in relative obscurity during his lifetime teaching rhetoric at the University of Naples. His succinct De nostri temporis studiorum ratione (1709) provides a useful lens through which we might consider the digital humanities. The work, known in the English translation as On the Study Methods of Our Time, was Vico’s first foray into philosophy, and was the seventh in a series of inaugural lectures given at the University of Naples in his position as professor of rhetoric. In his lecture, Vico took aim at the inadequacy of the critical and pedagogical methods of his contemporaries while weighing the comparative merits of classical and modern culture. In order to discern just how current “study methods” might be superior or inferior to the Ancients, Vico sets up a distinction between the new arts, sciences and inventions – the constituent material of learning – and and the new instruments and aids to knowledge – the ways and means of learning. Vico’s critique of the Moderns took issue with the logicians of Port-Royal, and their Cartesian method of compartmentalizing knowledge. For Vico, this reductive method of study precludes the human, and is inferior to that of the Ancients: “We devote all of our efforts to the investigation of physical phenomena, because their nature seems unambiguous; but we fail to inquire into human nature which, because of the freedom of man’s will, is difficult to determine.” The result, Vico warns, is that students “because of their training, which is focused on these studies, are unable to engage in the life of the community, to conduct themselves with sufficient wisdom and prudence.” By reducing what there is to know, he argues, we limit our ability to engage with the world on a broader scale. Diminished by our learning, we will be incapable of dealing practically with issues of change or transformation, which require the ability to recognize and follow the most suitable or sensible course of action. For Vico, the methods of logicians such as Antoine Arnaud and Pierre Nicole and their followers established the constituent material of learning through a process of narrowing the domain of knowledge. Much in the same way that Francis Bacon took issue with the syllogisms of the scholastics to argue that knowledge of the world should be grounded in carefully verified facts, Vico doesn’t limit himself to providing a new method to achieve old-fashioned knowledge. He redefines what it means to know. And, since the instruments (including logic) used by his contemporaries, those ways and means to that material which constitutes knowledge, were antecedent to the task of learning, the knowledge they yielded was determined by their premisses for their creation. In the technology they harnessed, and in the aims they fulfilled, these instruments were restricted by the discourses which produced them. In reducing knowledge to the unambiguous, the logicians of Port Royal reduced knowledge to what their brains and their technology enabled them to master. For the digital humanities, it is this category — the ways and means of learning — that carries within it a transformative potential for the constituent material of learning, but in a radically different way from that to which Vico directed his critique. In a scribal or a print environment, the constituent material of learning is often shaped and transformed by its means of transmission (see for example the work of Roger Chartier and Peter Stallybrass); that which is yielded instrumentally, will “speak” a language inherent in the design of the instrument. The critique Vico levelled at Cartesian method, that critics had placed “their fundamental truths before, outside, and above every bodily image of reality” illustrates an extreme case of how the instrument of logic could override the countenance of real life. In other words, if the only instrument available to us is a hammer, by constraint of circumstances, everything looks like a nail. In our current digital environment, we are only beginning to see how the consituent material of learning is radically transformed by the ways and means in which it is transmitted. Rather than dealing with a reduction of knowledge, this time technology has allowed us to expand knowledge into a boundless domain, one whose complexity trumps theory and whose scale defies our individual and physiological capacity to grasp it. The digital humanities is currently grappling with this conundrum: by transforming what it means to know something, particularly in a boundless domain of culture, a discipline is emerging which attempts to come to terms with current interaction of millions of different pieces of human culture, past and present, digital and analog, while critically reflecting on the very nature of human knowledge itself. David Weinberger has addressed this very problem in his book Too Big to Know. Weinberger makes a pithy call for a “rethinking of knowledge now that the facts aren’t the facts, experts are everywhere, and the smartest person in the room is the room.” One wonders what Giambattista Vico would have made of such a room. . .
A boundless domain of culture? There has been a flurry of debates recently surrounding the digital humanities, sparked in part by the publication of Matthew Gold’s volume, Debates in the Digital Humanities, and Stanley Fish’s extended responses in the New York Times. Annual conferences for both the Modern Language Association and the American Historical Association featured numerous roundtables and panels concerning the humanities computing, digital pedagogy and electronic infrastructures for scholarly work. The text based scholarship so vital to the work of the humanities (and its related infrastructure) is both complicated and broadened by digital technologies and the digital humanities has emerged front and center proclaiming its suitability as the discipline best positioned to explore a post-Gutenberg galaxy. Nearly sixty sessions at this year’s MLA had a digital humanities connection (see Mark Sample’s post). During a session on Literary Research in/and Digital Humanities convened by James R. Kelly, a Humanities Bibliographer at the University of Massachusetts Amherst, Heather Bolwby discussed some of the factors involved in successfully launching Julia Margaret Cameron’s photographic illustrations to Tennyson’s Idylls of the King as a digital resource. In her presentation, Bowlby pointed out some of the considerations she had to take into account with the project, including locating the necessary technical support, determining how the resource would function within different scholarly contexts, securing an enduring online space to house the resource, and collaborating with librarians and other professionals in related fields to fit the resource within pre-existing institutional frameworks. Which often lured her from herself. The digital duplication of the physical object, whether it be a rare photograph, a manuscript or a scholarly monograph, no longer poses difficulty, but the process of its expression and its context is at the crux of many of the debates surrounding digital humanities today. What form will that expression take? Will it conform to current (and future?) standards for preservation and sustainability? And what is the appropriate context for that expression? Will it ensure its continued expression over time? Will it allow the expression to be accessible to many or to a select few? Will the context overwhelm the expression? And will that context be re-iterated or aggregated in other contexts? If so, how? Just as the potential for duplication is seemingly endless in a digital context, so too is the potential for expression and for an infinity of contexts within this boundless domain. 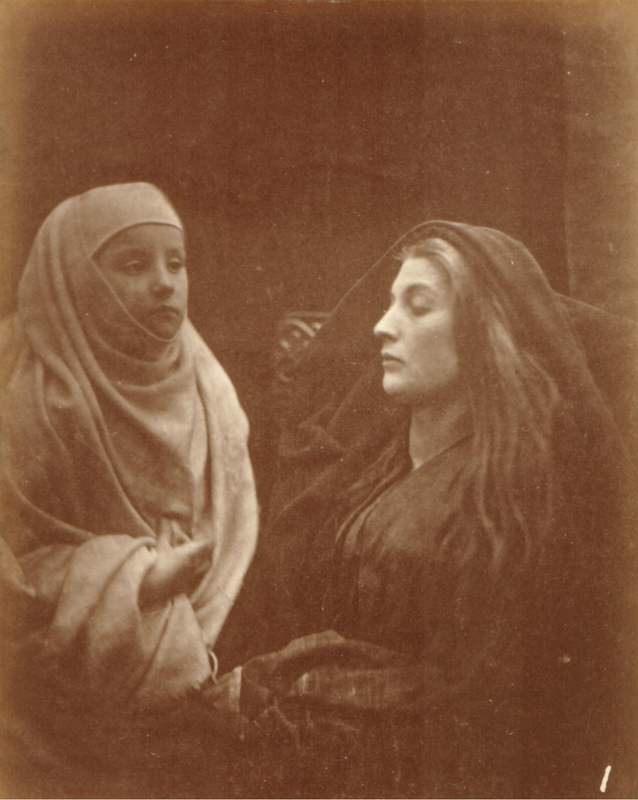 Pioneering photographer Julia Margaret Cameron was particularly sensitive to questions of reproduction and expression in her photographs for Tennyson’s work. Using a new and challenging medium such as photography in such unique ways for the time, Cameron’s illustrations deliberately imitated the oil paintings in the style of the contemporary Pre-Raphaelite painters. Why? As she explained simply, “my aspirations are to ennoble Photography and to secure for it the character and uses of High Art by combining the real and ideal sacrificing nothing of Truth by all possible devotion to Poetry and beauty.” Her project to “ennoble photography” is similar to the project of many digital humanists today: to ennoble their field as one worthy of expression and of context. What must the digital humanities find then to secure for it “the character and uses” of a discipline or a scholarly presence within a boundless domain of culture?